The reusable bags are environmentally friendly and completely biodegradable. 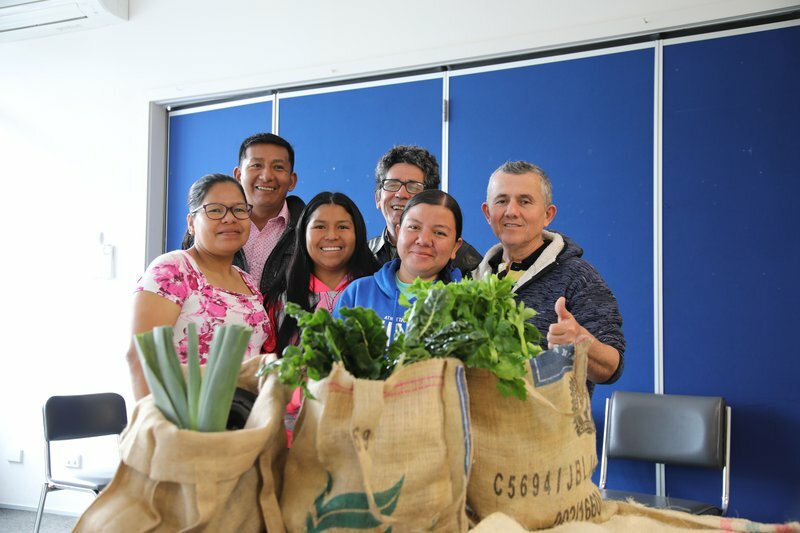 There’s a flurry of activity as six former refugees from Colombia make their way into the room and begin to layout coffee sacks and newly made shopping bags. Much like the project itself, they take the display very seriously, even using fresh vegetables as an added touch. After a quick photoshoot with their prototypes, they sit down to explain more about the origins of their project. It all started when New Zealand Red Cross helped them establish a social group before the beginning of winter, a time of year that can be difficult for people used to more tropical climates. They wanted to do something that would promote the small but growing Colombian community in Nelson. “Colombians are very good sewers, we are famous for this,” says Yonson Escue, President of the newly-formed Colombian Association in Nelson. With the rest of the country about to follow suit in banning plastic bags, this project could be the answer to peoples shopping needs. The fibre the coffee sacks are made from cabuya, the name for the fibre that comes from the agave plant. The plant is native to Colombia and widely used for gardening and as a fabric. The material is also completely compostable, an added bonus for the group as its members are largely motivated by environmental concerns. The team from Red Cross’ Pathways to Employment programme in Nelson is helping the group source donated coffee sacks and working with them to get the project off the ground. At the moment it’s stalled because they need an industrial sewing machine. “The fabric is very hard to work with and we just have a normal, domestic sewing machine,” says Janet*, one of the sewers who has been creating the bags. Turning the fluffy coffee sack fabric into smooth finished bags is the most time-consuming part of the process, but it makes them less rough and scratchy to the touch. An industrial sewing machine would take the production time for one bag down from around five hours to just 15-20 minutes. Once the bags are ready to be retailed they’ll be sold for $4 each and will be available in a number of different styles. The group are looking for a donated, or cheap, industrial sewing machine. If you or someone you know could help, get in touch with Claire Nichols from our Pathways to Employment team in Nelson on claire.nichols@redcross.org.nzmailto:claire.nichols@redcross.org.nz. You can also find out more about our Pathways to Employment programme, which helps former refugees find work, here.